This species is listed on CITES Appendix I. It is confirmed as occurring in two protected areas: Na Hang Nature Reserve and Cham Chu Nature Reserve (Le and Boonratana 2006), and may occur in others (M. Richardson pers. comm.). Based on interviews and specimen information, it may occur in Yen Tu Nature Reserve in Quang Ninh Province, but it is unclear whether a population survives (Le Khac Quyet pers. comm.). 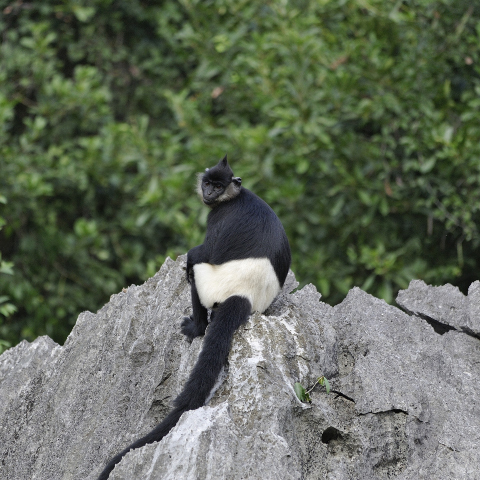 Nadler et al (2003) recommended the following conservation actions to preserve this species in Viet Nam: undertaking of further field status surveys; expansion of the protected area network and improvement of protected area management; mitigation of impacts from dam construction; and other options for conservation, including assessments of its behavior, diet, and ecological relationships in order to support a captive breeding program, and planning for subsequent release into a suitably designed, well-protected natural areas which can support it. Subsequent to these recommendations, the results of a stakeholder consensus workshop proposed: establishment of a species and habitat protection program; long-term monitoring program; long-term field studies on behavioral ecology; surveys; expansion of protected habitats; strengthening of protected area management; public awareness and conservation education; participation of stakeholder communities; relocation of stakeholder communities; and implementation of recommendations (Le and Boonratana 2006). An important conservation measure is the establishment of a species habitat/conservation area for Khau Ca Conservation Area in Ha Giang Province. Strict law enforcement is needed wherever the species still survives (Boonratana and Le 1998). This species is confined to a few areas in far northeastern Viet Nam (Groves 2001). Historically limited to areas east of the Red River (Nadler et al. 2003), its distribution has become dramatically restricted in recent decades due to massive deforestation and intensive hunting (Nadler et al. 2003). It is currently known only from small forest patches in Tuyen Quang and Bac Kan Provinces, and to a lesser extent in Ha Giang and Thai Nguyen Provinces (Nadler et al. 2003). This species is endemic to northern Viet Nam, and very rare (Nguyen 2000). A study of the Tat Ke Sector of the Na Hang Nature Reserve in 1993 estimated a density of less than 8 individuals/km2 (Le and Boonratana 2006); a later study, in 2004-2005, found far lower densities. 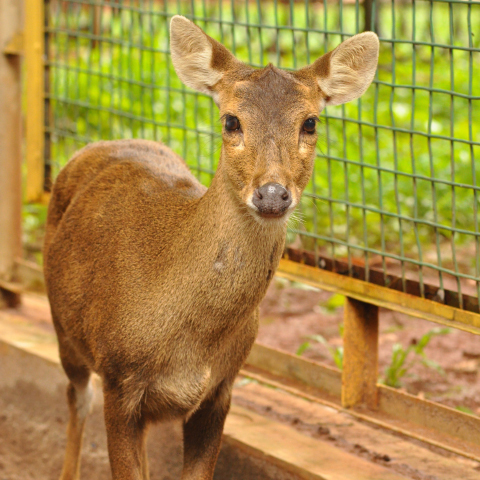 It has been suggested that hunting pressure is the reason for low densities in Tat Ke Sector, and former densities may have reached 20 individuals/km2 (Le and Boonratana 2006). The highest estimate for any one population was in the Ban Bung sector of the Na Hang Nature Reserve, at between 90 and 110 individuals in 1992 (Ratajszczak et al. 1992). There is a suggested trend of decline in both sectors of the Na Hang Nature Reserve, Tat Ke and Ban Bung (Le and Boonratana 2006). 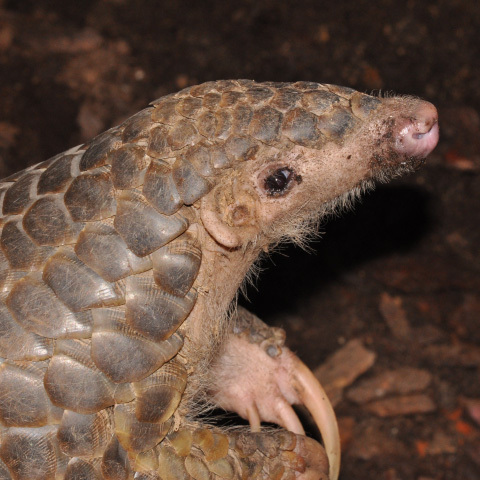 There are estimated to be about 250 individuals throughout its known range, though the global population could actually be higher, due to the possible occurrence of this species in other areas where it has not yet been recorded (Le and Boonratana 2006). 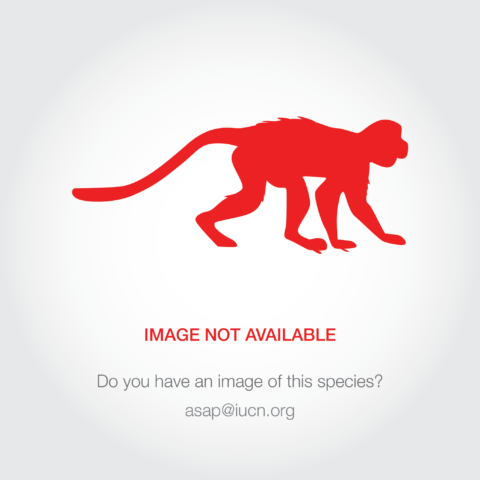 These animals are reported as threatened from habitat degradation and hunting pressure. There is an increase in habitat disturbance from humans in the southern sectors of the Na Hang Nature Reserve. They are not shy and do not necessarily flee when encountered by humans, increasing the chance of being shot (Nguyen 2000). Hunting is the most immediate threat to this species (Nadler et al. 2003), despite claims from various sources that it is not hunted. The only reason more individuals are not shot is due to the rarity of the species, and not because of law enforcement or awareness of the species importance (Long and Le Khac Quyet 2001). Although this species is not usually targeted for bushmeat hunting due to its "foul-taste", it is shot when encountered, and consumed or used in traditional "medicine" (Le and Boonratana 2006; Nadler et al. 2003). It has been found in trade in China, where it may be used for "medicinal" purposes (Nadler pers. comm. ), although this is likely to be limited. There is a high hunting pressure in the area where it lives, as evidenced by several gunshots heard almost daily during field trips (2004-2005) in the Na Hang Nature Reserve (Le and Boonratana 2006). Shifting and settled cultivation, as well as other land development activities, also pose a threat (Le and Boonratana 2006; Nadler et al. 2003). In the past, excessively intense and unsustainable legal and illegal logging and gold mining were the biggest threats. Recently, the development of a hydroelectric power project along the Gam River in Na Hang has caused large areas of its habitat to come under construction (Le and Boonratana 2006; Nadler et al. 2003). Also, sudden increases in human populations, especially construction workers, have led to increased demand for meat, and thus increased hunting pressure (Le and Boonratana 2006).